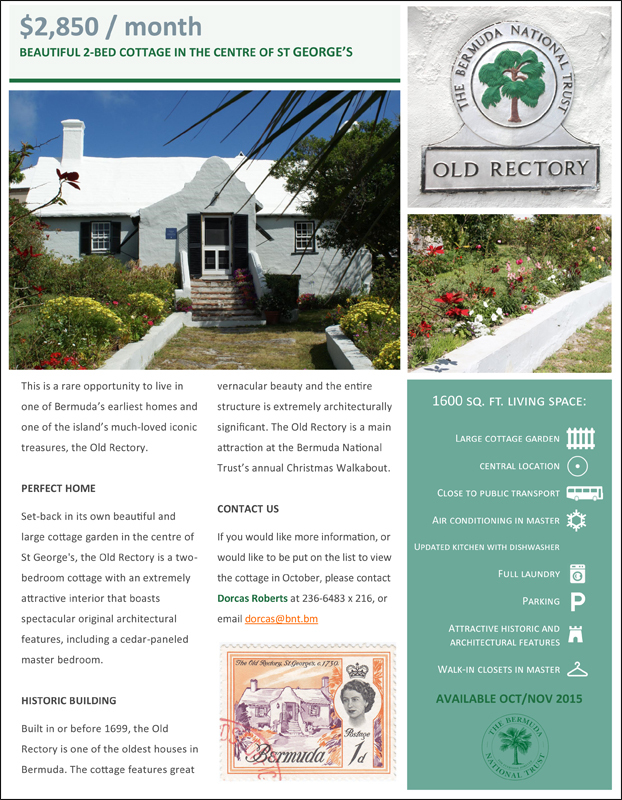 The opportunity is open to live in one of the oldest houses in Bermuda — the Old Rectory which was built in or before 1699 — with the Bermuda National Trust offering the 2-bedroom east end property for rent. The Old Rectory, which is located behind St Peter’s Church at 1 Broad Alley, will be open for viewing today [Nov 5] from 12-4pm, and is available for a monthly rent of $2,850. The BNT said, “Set-back in its own beautiful and large cottage garden in the centre of St George’s, the Old Rectory is a two bedroom cottage with an extremely attractive interior that boasts spectacular original architectural features, including a cedar-paneled master bedroom. The property offers 1600 square feet of living space with a large cottage garden, air conditioning in master, updated kitchen with dishwasher, full laundry, parking, as well as historic and architectural features. has to have ghosts in it! Wow, $2,850. How much would this rent for elsewhere? Seems to be that rents are/have crashed in the east end? From what I have seen, double that in a central parish. Yeah , a lot of people are erroneously hanging on to that dream that it’s still the good old days in real estate. They haven’t , or refuse to , reset their clocks and expectations yet . And I have a feeling you would be equally negative about it if the rent were expensive. These trust properties used to have a clause in the leases requiring them to be open to the public on certain days during the summer seasons. Don’t know if they still do but it might explain the ‘lower’ rents. During a walk-about in St. George’s held not too long ago the public were permitted to enter many of these old buildings; this particular cottage was one of many places to explore and may I say it was / is quite attractive to say the least…Now, as far as ghosts, that’s Tommy rot! That’s an odd name for a ghost.